"As RIA firms grow and continue to evolve into efficiently managed businesses built for enduring success, they will increasingly appeal to a broader range of buyers"
SAN FRANCISCO--(BUSINESS WIRE)--According to research conducted by Schwab Advisor Services on merger and acquisition (M&A) transactions1 in the independent registered investment advisor (RIA) industry, the first half of 2014 experienced a continued healthy pace of activity, with 29 completed deals totaling $32.6 billion in assets under management (AUM). Transaction activity picked up in the second quarter of 2014, with deal flow increasing from the first quarter. Sixteen deals were inked in Q2 totaling approximately $19 billion in AUM, compared to 13 deals totaling $14 billion in AUM completed in Q1. Second quarter activity nearly reached the record high levels of Q3 and Q4 of 2013, each of which saw 18 completed transactions. The average deal size also increased during the first half of 2014, reaching $1.13 billion, compared with $808 million in the first half of 2013. Data from Schwab’s 2014 RIA Benchmarking Studyi released in July, indicated that 9 in 10 RIA firms are looking to develop internal successors, suggesting that founders and principals are seeking continuity of their firm’s people, culture and values. Although M&A data for the first half of the year indicates a seller’s market in the RIA industry, many advisors are actually choosing not to sell. Instead they are continuing to grow organically and create value in their firms by building enduring enterprises. With more than one-third (36%) of all firms participating in Schwab’s Benchmarking Study having doubled their AUM and revenues since 2009, the steady M&A activity this year also reflects the healthy ecosystem of the RIA industry. The RIA model continues to attract not just investors and advisors, but also more types of acquirers – in the U.S. as well as internationally. M&A data for first half of 2014 showed activity among Strategic Acquiring Firms (SAF) moving upward from the levels of 2013, representing 38 percent of the total deals closed, versus 31 percent of deals completed by RIAs. Additionally, the data shows an increase in acquisitions by offshore-based entities, which represent seven percent of the total deals recorded for the first half of the year. Schwab Advisor Services reports M&A industry data twice yearly as part of a continued commitment to advancing the interests of RIAs, including a consultative approach that helps firms determine their transition options and plan strategically toward them. Schwab Advisor Transition Services helps advisors think through growing and exiting a business at the right time, with the right people and at the right value. This includes goal setting, evaluating options (internal succession, external sale, and merger or acquisition) and executing a transition plan. Schwab’s Transition Services includes Schwab’s M&A Listing Service, a national online database offered to independent registered investment advisors that custody with Schwab Advisor Services that connects independent investment advisors with firms interested in acquiring or selling their firm, or merging with another firm, and enables advisors to maintain anonymity while soliciting interest and collecting information from other advisor firms. Buyers also can search for investment professionals with books of business who would like to join an RIA firm. Additional information and new transitions content are available at www.SchwabTransition.com. © 2014 Charles Schwab & Co., Inc. (Schwab) (Member SIPC) All rights reserved. 1 All data compiled and analyzed by Schwab Advisor Services. 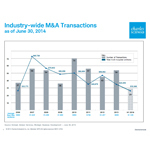 Data reflects firms being sold with assets under management exceeding $50 million as of June 30, 2014. Since the inception of the study in 2006, more than 2,800 firms have participated, with over half being repeat participants. A total of 1,132 advisory firms representing nearly three-quarters of a trillion dollars in AUM that custody their assets with Schwab participated this year, making this the leading study in the RIA industry.